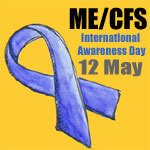 New badges showing the joint ME/CFS and Fibromyalgia Awareness Day on May 12th following a request. You can use any of these banners/badges on your blog or web site to show support for ME/CFS and Fibromyalgia International Awareness Day on 12 May (every year). The code shown here links to this blog. You can change that to link to another site if you wish. Highlighting just some of the ME/CFS Awareness clothing, badges and other merchandise available online. Please check availability, terms and where proceeds go to with individual sellers. A couple more square badges ideal for use as profile pictures or avatars. Also in a small size for your blog or web site. The Blue Ribbon Campaign have created a MySpace cause for users to join, in addition to the Facebook cause and Facebook group. They are also encouraging MySpace members to use a blue riboon as their profile picture during ME Awareness Month in May. You can use one of the badges from the ME Aware blog. The Blue Ribbon Campaign also have some of these badges on their site. If you are a Twitter user you can follow @BlueRibbons4ME to follow the latest developments in the campaign. More badges for use on your blog or web pages have been added to the Badges page. The new images include a couple of smaller images and a series of six badges with text taken from various ME/CFS web sites and organisations highlighting some of the symptoms, effect on lives and statistics for this illness. Either copy the code below the image and paste to your site or save a copy to upload to your own site.